Single location in the community Brauneberg (Bernkastel area) in the German wine-growing region Moselle, Even the Romans recognized the exceptionally favorable climatic conditions and cultivated vines here. At the foot of the excavation of a Roman wine press is to visit. The first part of the name refers to the former possession of the Franciscan nuns, which were popularly called in the Rhineland dialect "Juffen" (virgins, prayer sisters or bigots). 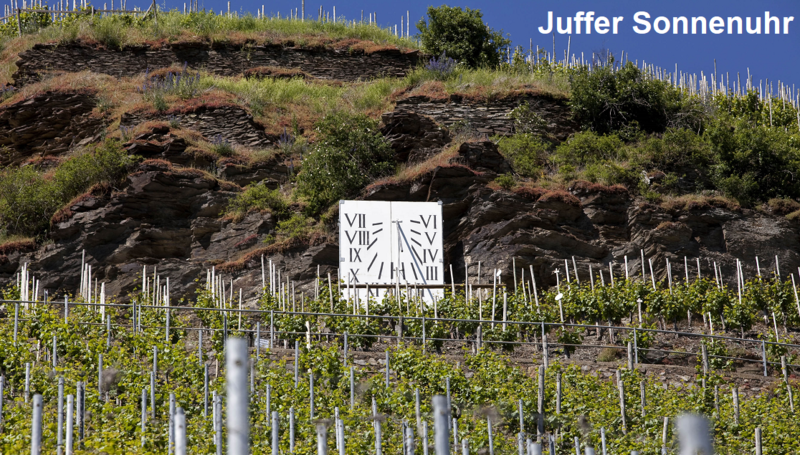 The second part of the name refers to the sundial located in the vineyard. It is the filet piece of the famous Brown Mountain, the subsequent location Juffer is considered not quite as high quality. The oriented south to southwest vineyard in 110 to 210 meters above sea level with 60 to 70% slope covers 10.5 hectares of vineyards. This page was last modified at 1 July 2017 at 18:59.